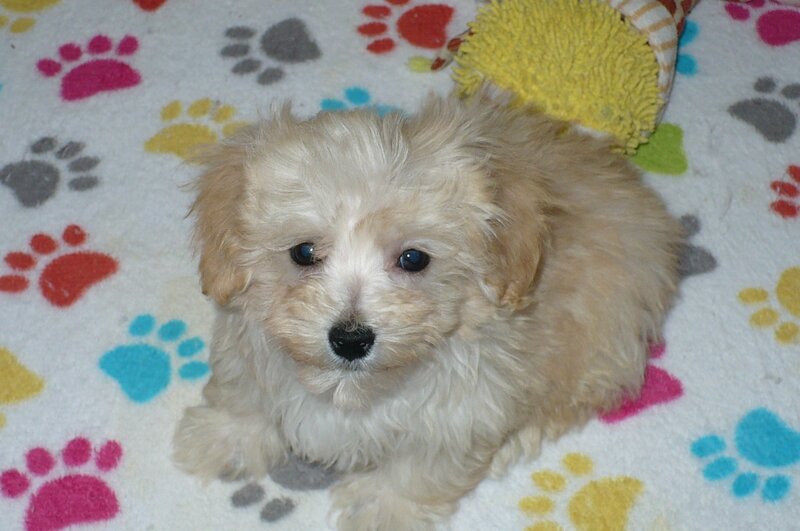 The Maltipoo (also known as moodle) is a cross-breed/hybrid dog obtained by breeding a Maltese and a toy or Miniature Poodle. A Maltipoo is one that was bred from a Maltese and a Poodle. This dog is a combination of two recognized breeds that itself is not recognized by kennel clubs such as the AKC or the KC. The Maltipoo commonly weighs between 2 and 20 pounds, stands between 4 and 14 inches high at the shoulder, and usally live anywhere from 12 to 15 years. They are born with a wide variety of colors, including black, white, cream, brown, peach, gray, and fawn. Many Maltipoos are bicolor, with a mix of white and another color on their bodies. Their color can sometimes change over time. Their noses can also be black or pink. They get their attitude and charming ways from the Maltese and their smarts from the Poodle. They love kids and are very playful. They mostly get along with all dogs but may sometimes have problems. They are on the calm side but they will sometimes bark.